Jovi is so fun to be around. I have a hard time putting her down so I can go to work. It is so cute when she smiles, laughs, coos, screams (in a good way), stomps her feet, waves her arms (she flails her limbs when she get excited). When she is in her car seat her favorite toy is the strap that tightens the shoulder restraints. She likes to pull it (she can pull it hard enough to tighten it yet) and chew on it, and totally ignores the half-dozen items attached to the handle above her. Last Sunday she participated in a model search competition for The Cottage in Old Town Spring. 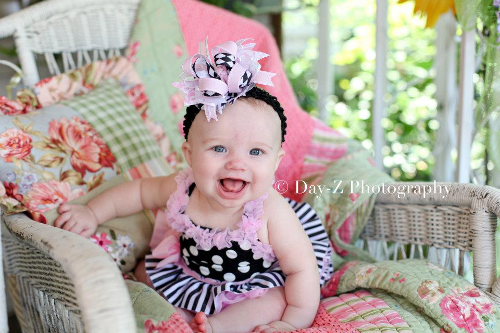 She was very cute in a Mud Pie one-piece swim-suit (black polka dot with light pink frills). You can help her win by voting for her. To vote, Like The Cottage‘s page on Facebook and then Like Jovi’s picture. Jovi went on her first plan trip this past weekend. 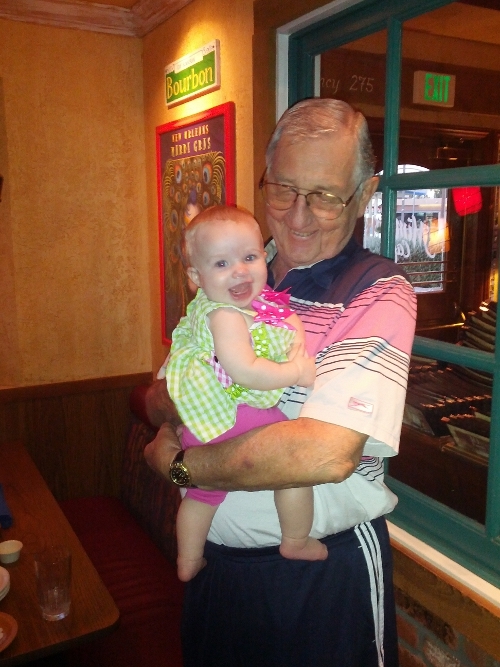 We went to Phoenix for Father’s Day (more about in my next post) to see my dad (and mom and sister), Grandpa Mel, and cousin’s (and aunt). She did great on the plane both there and back, which was my biggest worry. She fell asleep before take-off both times, she woke-up before we landed, just in time to eat on the way there, but on the way back stayed asleep all the way through. We have another trip next month e San Diego, definitely makes me feel better about that having had this one go so well. I find myself thinking more and more about her growing up and not wanting that to happen too fast. I am so glad it is easy to take pictures with phones, I like having them now, and when she’s older I think I’ll be even more happy about it.